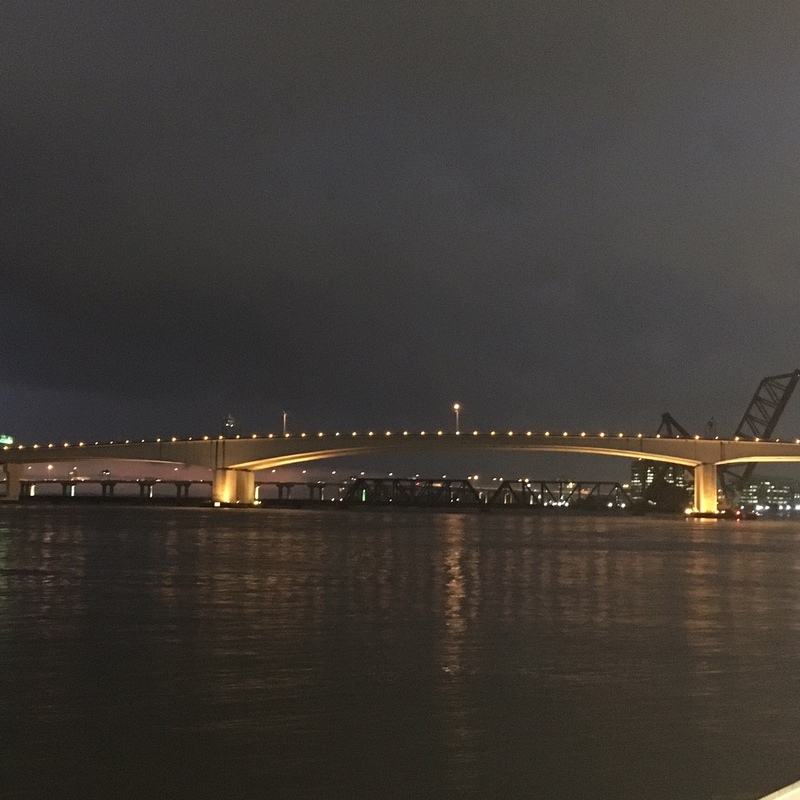 I was in Jacksonville, FL this week for training. I came back yesterday because of the hurricane. This is my third out-of-town trip for training this year. In my previous job, I worked as a consultant and traveled all the time, but it was in state and I was always home by bedtime. Sometimes later than my actual bedtime, but I went to sleep in my own bed. With this job, I don't travel in the state nearly as much anymore, but now I travel for training. Because those trainings are with the federal government, I travel out of state more. Working out on the go was never really a thing for me before. I never actually thought about it. Now I do. I'm used to being in the gym a lot and I really don't want to undo all the hard work I've done, so when planning this week, I thought a lot about what kind of exercises I could do while I was in Florida. There is always the hotel gym. I personally hate the hotel gym. I tell everyone that if left to my own devices, I do thirty minutes on the elliptical, ten minutes on weights (that's probably a stretch) and I'm done. I won't have pushed myself very hard and will be very lackadaisical about it. This is why I do classes. Put me in a class and I have just enough (read: ridiculous, it's ridiculous) amount of a competitive spirit that I push myself every time so that I'm not the last or the worst. Some might think that's not what you're supposed to do, you're probably right, but I also know that's how I get results. Also, I hate the treadmill. We aren't friends, not even a little. So the hotel gym doesn't really work for me. It can if it absolutely has to, but no. So here's what I've done so far this week and what I've done in the past! I love hotel yoga. I don't take a yoga mat with me because I need that precious space in my luggage for clothes and shoes. A girl needs options. But most hotels have carpet or a rug on the floor, so I make due with that. I do hotel yoga in the morning when I get up. It takes about 15-20 minutes, depending on what I'm doing, and if you do nothing else while you're out of town, at least you've done this. Inhale your hands overhead and bring hands to heart center. Inhale to lift and lengthen, flat back. Plant hands. Step back or hop into plank. Step or hop your feet to your hands. Start back at the beginning. This is the variation that one of my yoga instructors taught me and there are multiple versions of Sun Salutation A. I do this four to five times. After the fifth time, I move into Sun Salutation B. This is where I add in whatever I'm working on. Begin from your last Sun Salutation A, stepping or hopping your feet to your hands. Lift your hands into chair pose. Inhale to lift and lengthen. Plant your hands. Step or hop back into your chaturanga. Inhale for cobra or updog. Sweep the right leg up into three-legged dog. Bring the foot between your hands. Pull the right knee up, hold. Send the leg back into Warrior III. Hold. Land the right foot onto the ground, move into Warrior II. From there, I like to add in whatever move I'm currently working on. Right now it's crow and working through pigeon. I used to hate pigeon, but I've been doing it long enough now that I've started to play with it. So I would cartwheel the hands down and frame my left foot, bring my right foot up to my left and forward fold. Then work into crow. Then do the same thing for the left leg. I close with doing pigeon, bridge and few twists. I did my yoga in the morning...so I didn't take photos. I'm not that coherent in the morning. I like classes, so I found a gym in Jacksonville near my hotel. I had a very short trip, so I didn't end up using it. I also checked out Class Pass, a service that allows you to pay one fee and use multiple gyms in your area and where you're traveling. Unfortunately, Class Pass isn't in Jacksonville, so I didn't get a chance to check it out. If you travel a lot, though, it's worth a look into! New cities are fun, so go explore! I did this my first and second night in town. I traveled by myself this week, so I made sure to do most of my exploring in the daylight. 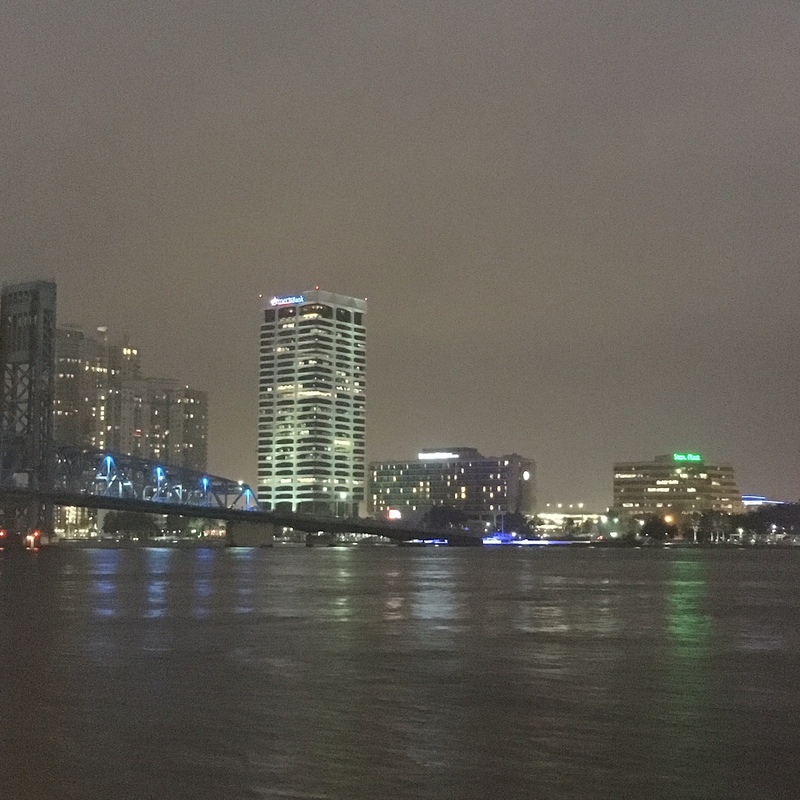 It was super rainy, so I didn't do as much as I would have liked, but I made sure to venture out for dinner along the river. I also like to walk around airports instead of sitting in a chair the whole time. My airport days always get me lots of steps on the Fitbit! 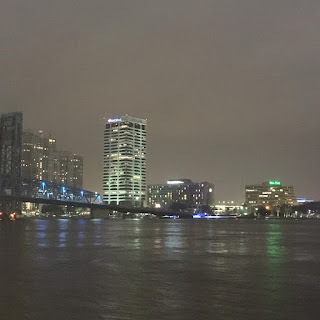 Just a few photos from my wanderings around Jacksonville. I loved their bridges and views over the St. James River.